This sestiere gets its name from the peculiar shape of its very hard land, which emerged from the lagoon like a back (dorso). Another name was Scopulo (rock) from its shape. According to other sources the name comes from the Paduan family Dossoduro, which was among the first inhabitants of the island. Finally the Negri’s version derives the name from “Deorsum turris’ (over the tower) assuming that Castel Forte di San Rocco had once a big tower. In the old times this area wasn’t safe because of frequent barbarians’ incursions. 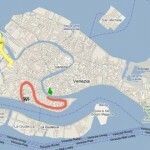 Doge Partecipazio, elected in 864, assigned this area to his personnel as residences; these people were called “excusati” (excused) because they were excused from any other duty or service. 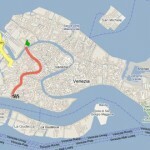 The sestiere of Dorsoduro was developed from nearby areas and today it also comprises the islands of San Giorgio and Giudecca. 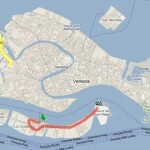 Zone: Historical Area | Sestiere "Dorsoduro"
Zone: Historical Area | Sestiere "Dorsoduro" | Sestiere "San Polo" | Sestiere "Santa Croce"
Zone: Giudecca Island | Historical Area | Sestiere "Dorsoduro"